FOR A PRICE, EMAIL ME A PHOTO. I am the premier chair repair expert on Long Island. From carved parts to turned parts to any replacement part, we do it all. We have a Pick Up and Delivery Service available or you can bring your furniture to our full woodworking shop. Contact us with any requests for a custom built piece of furniture and browse some of my previously built custom furniture. 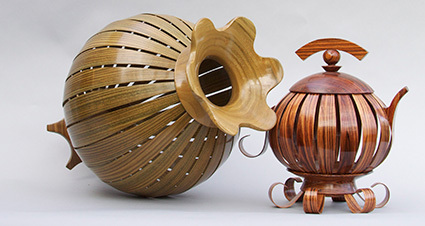 View some of the amazing wood art I have created over the years. Long Island Chair Repair Service has been in business since 1980 and are striving to please our customers with all jobs. Long Island Chair Repair Service is a Division of B. W. Company. We build Custom Furniture and Repair and Refinish modern furniture to its original state. We specialize in Antique Restoration, Some of our skills include, Caning, Furniture Repairs-Restoration, Carving, Veneering, Turning, Chair Repairs, and Re-gluing, Upholstery of Chair Seats, Chair Parts, Seat Weaving, Touch-ups, Polishing, Waxing, Woodworking, Water, Smoke and Fire Damage. We provide Digital Photo's and Written Insurance Estimates and work with many insurance companies to provide a worry free restoration of your furniture. We also have a Pick Up and Delivery Service available or you can bring your furniture to our full woodworking shop. We understand that dealing with a loss or damage of any property is stressful and the last thing any one wants to deal with. We'll make the process of restoring your furnishings swift and painless. We will work with you and/or your insurance company to make sure the process of restoring your property back to it's pre-loss condition is handled professionally and promptly. Whether it be damage incurred from a moving truck or delivery, or damage caused by fire or water, you can bring us all of your furniture refinishing, repairing and restoration needs. Bill Holland have done wood repairing and refinishing work for me over 15 years. My 20 year old off-white dining set had begun to discolor and I called Mr. Holland for his expert service. When my set was returned it looked brand new. Thank you Bill for your expert service. We have had Bill Holland work on a number of projects for us, ranging from the simple to the complex. Projects included building custom bedroom furniture, building and installing a mantle over our fireplace, refinishing antique furniture, and creating artistic pieces to beautify our home. Bill is not just a craftsman, but an artist as well. He has a true passion for everything he does - woodworking, custom furniture building, carving, turning, refinishing, etc. and he continuously increases his knowledge and skills to be able to serve his customers better. Bill is not afraid to take on challenging jobs and he immerses himself in his research to determine the best way to meet his customer's needs. His integrity and honesty is beyond reproach. I recommend Bill Holland without hesitation for any project you may be considering him for. I have been working with Bill Holland for many years. I have asked him to provide services from reconfiguring kitchen cabinets in my home to custom furniture construction here at Stony Brook University. His knowledge and experience in all matters of antique restoration and intricate stain matching is unparalleled. His interest in tackling new challenges and his confidence that absolutely no problem is too big or unmanageable makes the process of "starting from scratch" the enjoyable ride it should be. His quotes are accurate. His delivery is always reliable. Whether he's meeting you to discuss a project in a conference room or in a barn on Sunday morning, projects with Bill are always fun and provide professionally crafted solutions. Bill the owner of Long Island Chair Repair Service made our daughter's solid cherry wood sleigh design crib for us. It was beyond our expectations, the crib was made from Long Island cherry trees that Bill cut down and milled. Bill worked with us on the design, he was patient with our requests and spent numerous hours on the design and the crib safety features. When we received the sleigh crib, it was exactly what we asked for and done on time for the baby's arrival. He also designed the crib to convert to a toddler bed, which we will be able to use for many years. The crib is so unique, a true form of art and is of exceptional quality. He even hand carved a beautiful angel on the headboard which made the crib a one of a kind. Bill is a true professional and a rare talent, he takes pride in his work and in the fine details, we are so pleased with the results! Suffolk County - Amagansett, Amityville, Babylon, Baiting Hollow, Bay Shore, Bayport, Belle Terre, Bellport, Blue Point, Bohemia, Brentwood, Bridgehampton, Brightwaters, Brookhaven, Center Moriches, Centereach, Centerport Central Islip, Cold Spring Harbor, Commack, Coram, Deer Park, Dix Hills, East Farmingdale, East Hampton, East Moriches, East Patchogue, Elwood, Farmingville, Fire Island, Fort Salonga, Greenlawn, Greenport, Halesite, Hampton Bays, Hauppauge, Head Of The Harbor, Holtsville, Huntington, Huntington Station, Islandia, Islip, Jamesport, Kings Park, Lake Grove, Lindenhurst, LLoyd Harbor, Manorville, Mastic, Melville, Middle Island, Miller Place, Mount Sinai, Nissequogue, North Bayshore, North Haven, Northport, Noyac, Oakdale, Ocean Beach, Old Field, Patchogue, Port Jefferson, Quogue, Remsenburg, Ridge, Riverhead, Rocky Point, Ronkonkoma, Sag Harbor, Sagaponack, Sayville, Selden, Setauket, Shelter Island, Shirley, Shoreham, Smithtown, Southampton, Southold, Speonk, St. James, Stony Brook, Wainscott, Watermill, Westhampton, Westhampton Beach, Wyandanch, Yaphank and so many other great towns. Nassau County - Albertson, Bayville, Bethpage, Brookville, Centre Island, East Meadow, East Norwich, Elmont, Farmingdale, Floral Park, Flower Hill, Franklyn Square, Freeport, Garden City, Glen Cove, Glen Head, Great Neck, Hempstead, Hicksville, Island Park, Jericho, Lake Success, Lattingtown, Laurel Hollow, Levittown, Locust Valley, Long Beach, Malverne, Massapequa, Matincock, Merrick, Mill Neck, Muttontown, New Hyde Park, North Hempstead, Oceanside, Old Brookville, Old Westbury, Oyster Bay, Oyster Bay Cove, Plainview, Plandome, Port Washington, Rockville Centre, Roosevelt, Roslyn, Saddle Rock, Sea Cliff, Syosset, Uniondale, Upper Brookville, Valley Stream, Westbury, Woodbury. © 2019 Long Island Chair Repair Service, All Rights Reserved.